There are many benefits to having a blogging program in your classroom. One advantage is that blogging can be the perfect avenue to teach digital citizenship. What is digital citizenship? Not so long ago “cyber safety” or “cyber bullying” were key terms associated with our “internet safety” programs. Now as our world becomes increasingly digital, our associated challenges, rights, and responsibilities are changing. Digital citizenship is used as more of an umbrella term for our goals to help our students to be safe, happy, productive, and ethical online. These same goals that we have for our students’ online experiences also apply to their offline world. empowering your students with skills to think critically, behave safely, and participate responsibly online, allowing them to connect and collaborate in meaningful ways. All teachers know how important digital citizenship is. Students don’t always have the life experience or brain development to navigate technology safely and effectively. So, like many other areas of life, they need guidance from trusted adults. We also know what a big role technology plays in our students’ lives. Even if students are not online very much during the school day (or online on “protected” platforms), many begin connecting, sharing, viewing etc. as soon as they walk out the school gates. As educators, we can’t ignore this fact or waste the opportunity to tap into students’ interests and help steer them in the right direction. But how do we teach digital citizenship? There are many stand-alone lessons or units of work out there. Some schools “tick the box” by covering digital citizenship in the first few weeks of the school year and then move on. I also believe that digital citizenship education should begin very early on, as soon as children begin accessing the internet. Blogging allows a simple awareness of digital citizenship to start being developed at any age, even in kindergarten classrooms. Then, students can progressively build on their knowledge and skills. Blogging can offer not only a safe space to practice digital citizenship, but also authentic dilemmas, discussions, and interactions. And hopefully blogging is something that’s weaved into your classroom program so it’s ongoing throughout the year. Let’s look at eight ways blogging can be used to teach digital citizenship. Netiquette, or online etiquette, describes the positive standards we set for online behavior. Like many aspects of digital citizenship, the same standards you’d set for offline encounters apply to online interactions. So, being courteous, polite, responsive, friendly, respectful etc. Commenting on other blogs is a fabulous way to practice and discuss netiquette. A one-off lesson just wouldn’t have the same impact as ongoing authentic communication through blog comments. The whole concept of digital footprints or online reputations is becoming more important than ever. Publishing on a public blog means putting yourself out there for others to see. While this might seem scary at first, blogging can offer the ideal opportunity to learn and practice the skill of managing your digital identity. We know that having no digital footprint at all is no longer an ideal option. Potential employers and higher education institutions increasingly consider individuals’ online profiles and search results when making selections. Who knows how else digital footprints will be used as our students grow up. A big part of being an internet user is being able to effectively research, curate, and share information. This involves critical thinking and creativity. Students could practice this skill randomly. Or, they could develop their skills over time through a blogging program. John Spencer explains how content curation is a vital part of the creative process in his post, “Getting Started with Content Curation in the Classroom”. ..if you watch people engaged in creative work, they are often critical consumers of the same type of work they create. There’s this ongoing cycle of critical consuming, inspiration, and creative work. As they create more, it leads to a deeper ability to consume critically, where they find more inspiration, and the cycle continues. Creativity is a skill that’s always going to be in high demand. How amazing would it be if all our students graduated being able to confidently and fluently follow this cycle of critical consuming-inspiration-creative work? Then when you begin to form connections through blogging, there might be new opportunities for communication. For example, skyping or emailing blogging buddies, or collaborating on Google Docs. A blogging program offers an amazing way for students to learn and practice various forms of communication. Not so long ago, students had limited choice in how they could communicate. It was basically pen and paper, or Microsoft Word if you were lucky. Now there has been an explosion of tools for online communication and the biggest dilemma is often now finding the right tool for the job, and learning how to communicate clearly and responsibly. As students progress as bloggers they can begin to make their own choices about communication. This independence and experience will certainly benefit them both as students and members of society. Bloggers quickly learn that they need images to enhance their blog posts. But where do they find images? Blogging is the perfect way to teach students that the can’t just rely on Google Images and they need to either create their own pictures or use Creative Commons work. 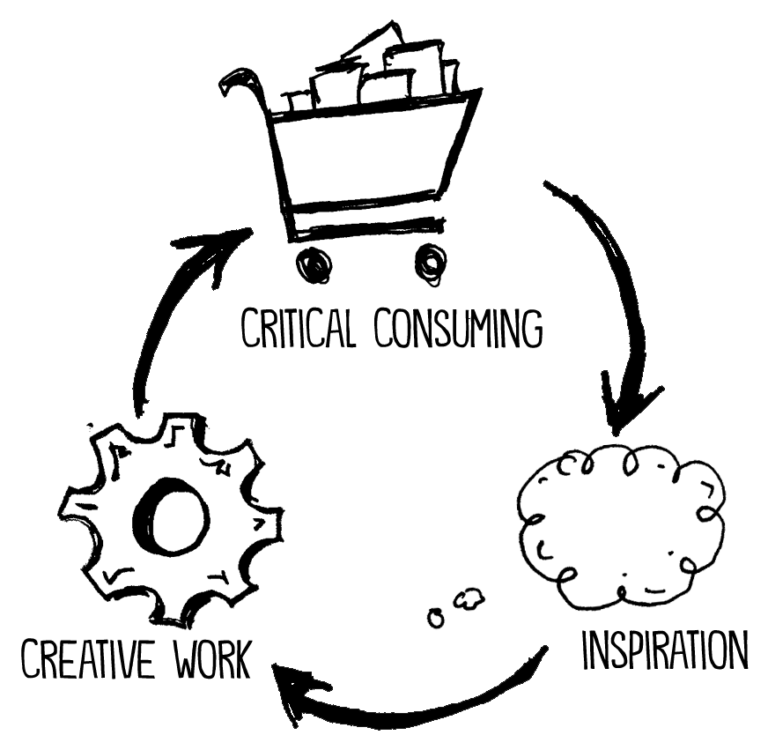 Through blogging, students can learn how to become fluent at sourcing, using, and attributing images. These sorts of lessons would have little meaning or impact without a real purpose. Our Educator’s Guide to Copyright, Fair Use, and Creative Commons is a popular resource with more advice on this topic. I have also published a guide on my own blog to finding free images with a breakdown of some websites you mind find useful. Encouraging children to be healthy both physically and mentally has always been a key concern for educators and caregivers. With mounting (real or perceived) pressure to be constantly connected comes the need to set up healthy habits. Through blogging, there can be classroom discussions about taking breaks from digital devices (for example, you can set boundaries as to when you’ll reply to blog comments). Another interesting topic is staying focused Vs multitasking. It’s easy to multitask when you’re writing blog posts. You have the distractions of the internet at your fingertips. Even if you put aside email and social media, it can be tempting to switch between researching, writing, finding images, and all the other things you need to do to put a post together. Research shows that true multitasking just isn’t humanly possible. Being able to stay focused is certainly a healthy habit and also seems to be a desirable attribute of our future workforce. This is something that can be practiced through blogging. The divisions between our online and offline worlds are blurring and many of our most valuable possessions and information are now housed online. Students need to learn to use passwords/passphrases. This can be practiced through blogging if students have their own blog or have user accounts for the class blog. how to keep passwords safe. If you want to learn more about passwords, we have a post with advice for teachers and students. Digital access is often an invisible issue in education. There are all sorts of barriers to equitable access to technology for students. What does this have to do with blogging? Firstly, blogging can be a way to raise awareness about digital access. Students could also help come up with some practical ways to make technology more accessible. This could include anything from lunchtime or after school clubs for those without technology at home, to finding ways to make blog posts more accessible to the vision impaired. When connecting with other classes globally, I personally found that we were connecting with a lot of classes from similar “wealthy”/first world/English speaking backgrounds. Once aware of this, I began making a concerted effort to broaden our horizons. Sometimes an awareness is a good spark to initiate change. You might introduce students to a website like Internet Live Stats which presents live data on internet use worldwide. It’s easy to live in a bubble of your own community. Students might be surprised by some of the data on this website, including the fact that only 40% of the world’s population has internet access. When we get going with technology in the classroom, the gap between the “have” and “have not” can widen. It’s important to not only keep this in the back of your mind as an educator, but raise the issue with students as well. As you can see, there are many ways that blogging can be a useful catalyst for bringing digital citizenship into the classroom. Sometimes, stand-alone lessons or even mini-lessons on digital citizenship are useful and necessary too. But if you’re looking for something that provides authentic and ongoing opportunities for teachable moments, blogging is ideal. Also remember, digital citizenship education is not just about protecting but also about empowering. Blogging is an excellent way to begin empowering students with the skills, knowledge, and practice they need to navigate their evolving digital lives. What do you think? 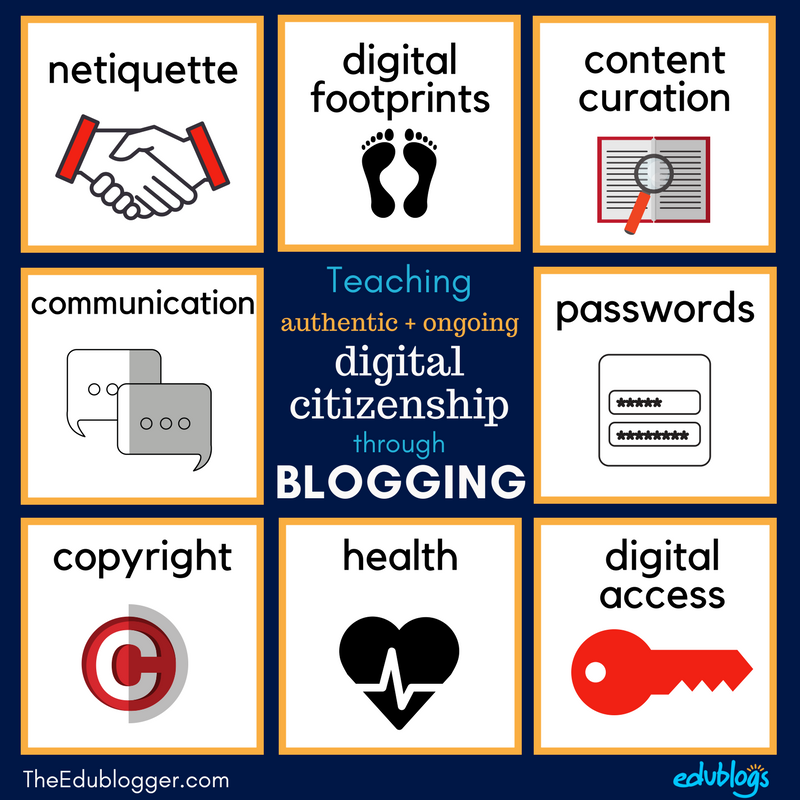 Have you taught any elements of digital citizenship through blogging? What other strategies do you use to cover digital citizenship in your classroom? We have adapted the infographic in this post into a poster which you’re welcome to print or display on your blog! Thank you to Ines Pinto for the Portuguese translation of this post and the infographic. Thanks for the post. As an art teacher, I particulary enjoyed reading the comments from John Spencer about creativity. I plan to display the .pdf poster of 8 ways to use blogging/ digital citizenship in my art classroom. This will help students to navigate through their life as a digital consumer/citizen. John Spencer always writes really interesting posts. I often find myself considering new ideas and perspectives when reading his blog! So glad to hear the poster is going to be useful in your classroom. I have never thought of blogging as a way to have ongoing conversations about digital citizenship before. Not only can you support tons of standards in many different content areas through blogging, we can also support essential skills for students in this area. Sometimes in blogging with students some of these things naturally come up, but I love the thought of planning specifically for conversations around digital citizenship as it relates to my students. Thank you! Hi Kris, I’m glad this post gave you some new food for thought! It probably is a good idea to have both spontaneous mini lessons as things come up, and plan for more directed conversations, as you said. I’m sure the students would really get a lot out of that approach. Good luck! I was working out how to ask permission to use your infographic before I was halfway through the post. Thank you for providing a way your readers could use it. Great info in the post too. Thank you. So glad it’s helpful. Feel free to use the infographic however you like! I found this to be quite interesting and am going to incorporate some it in my Social Studies classes. Students seem to be under the impression that what they put out there will only be between them and their friends. Knowing about digital footsteps and copyright issues will go a long way to ensure students safety and well being. You’re right, Suzanne. It is such an important topic and that’s great to hear you’ll be able to incorporate some of this material into your classes! Teaching digital citizenship is so important. Kids don’t realize that what they say and do online can affect them negatively down the road. As much as kids use the internet and see other people making negative comments and material, it is easy for them to accept that as the norm. They need understand how their actions an affect others and themselves down the road. Hi Stephanie, it can certainly be hard for students (and adults) to think about the future implications of their actions. Hopefully some regular discussions and activities can help! very interesting and informative. citizenship education should help in educating people and specially Indian youth. Thank you kathleen for taking the time to list all these aspects of digital citizenship so important for our students today. I believe that in the globalized world we live in today, and having quite a wide access to technology, students truly need the tips to become respectful and accountable for their “online acts”. Ethics and consideration for others also are important part of the global competencies of students nowadays. You’re right — just because students are online a lot, it doesn’t mean they have the maturity or experience to navigate safely. There are so many ways digital citizenship can be authentically explored through a blogging program. The students can then transfer these skills to other platforms and services they’re using. Sorry for the delay, Ines. You’re welcome to translate the infographic. Thank you! Kathleen. This is a wonderful post. I will be adding the infographic to my blog as well. You did a super job developing a useful succinct message about digital safety. So glad you found it helpful, Candria. Thank you! As technology coordinator at my school, I’m constantly stressing the importance of taking measures to protect the students and guiding them safely through cyberspace. Of the eight topics the one that has been most crucial is digital access. Why? Because we were hit by a category 5 hurricane last semester and some of the students are still without power in their homes! Of course, if there’s no power, they have no access to the Internet. Teachers, students and other staff are still adjusting. Thanks for this timely post! I hope your students families may recover soon and have power back at home. I have a young friend in a small village in ” Guiné Bissau” where there are only two hours of internet connection each day, for there is no electricity in the village, lost in a beautiful forest, so they use solar panels to collect energy during the day. He is 18 years old and finishing high school. Totally agree! It is a wonderful way to teach all aspects of digital citizenship…they learn so much by doing! Copyright was a huge eye-opener for my 7th graders, such a great learning experience. Yes, it’s certainly eye-opening for many students (and teachers) when you tell them you can’t just use anything you find on Google images! Thanks for your comment, Teresa. This was a great post! Thank you, for putting it all so succinctly! I will be passing this on to colleagues at my school. Great post! I would like permission to print the poster of 8 ways to use blogging as a digital citizenship to hang in my classroom and in the 2 fifth grade classrooms! I think it’s a great visual to help remind them of their responsibilities as a digital citizen. Of course, you’re welcome to use it. In fact, your question prompted me to adapt the infographic into a PDF file which might be more helpful for you. Thanks!